One of our members was recently surprised to see a large group of loons on the lake – he counted 10 and photographed nine of them. 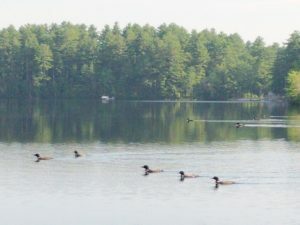 Generally we have four loons on the lake (2 nesting pairs), with an occasional visiting loon. We do have two loon chicks this year as well. Our guess is that with only one nesting pair this year (if you recall one nesting loon killed earlier this year), there are no loons defending the territory on the north-west part of the lake. 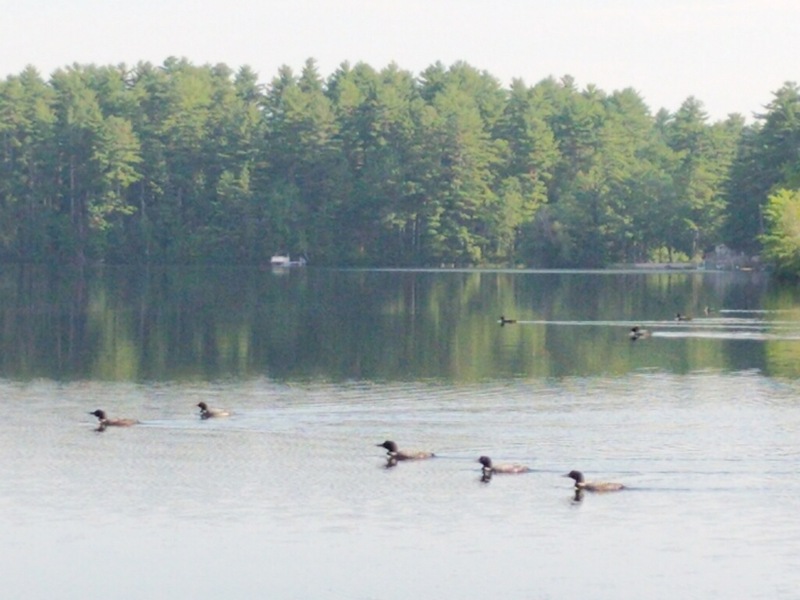 If you want to learn more about the loons, please join us for “The Loons of Maine and Watchic Lake” on 8/11/2018 10:30 am to 12:00 pm at Standish Town Hall. Lee Attix, Director of the Loon Conservancy, will lead the event. For more information contact Steve Lajoie at steve03229@aol.com. Bob and I noticed a large group when boating at sunset last Fri, Aug 10th, on that end of the lake. Rough count was 7, with no apparent defensive behavior, just floating around in close proximity on the far side of the big island. Just the usual loon parents and rapidly growing twin offspring on our end of the lake.